This Saturday, Kate Middleton and Prince William will have been married for six years. And they're still going strong! The two have experienced many milestones over the years, mainly becoming parents—twice! They have also traveled abroad, met world leaders and celebrities and found their permanent home. Check out all the "firsts" the Duke and Duchess of Cambridge have experienced since their royal wedding on April 29, 2011. May 2011—Royal Honeymoon: Kate and William take their first vacation as a royal couple in The Seychelles. May 2011—Welcome Obamas: Also that month, in what marks their first royal duties since the wedding, the Duke and Duchess of Cambridge meet then-U.S. President Barack Obama and First Lady Michelle Obama at Buckingham Palace, home of reigning ceremonial monarch and his grandmother Queen Elizabeth II. June 2011—Coming to America: The royal begin their first official North American tour. They start their visit in Canada, where they attend the National Canada Day Celebrations at Parliament Hill, a tree planting ceremony at Rideau Hall, a cooking workshop and reception at the Institut De Tourisme et d'hotellerie du Quebec and other events. The two also visit the United States for the first time, traveling to California, where they attend Variety's Venture Capital and New Media Summit, an outdoor reception at the British Consulate-General's residence, a charity polo match at the Santa Barbara Polo & Racquet Club and hang out with celebs at the 2011 BAFTA Brits to Watch event. Kate stuns with a lilac Alexander McQueen gown. July 2011—Home Sweet Home: Kate and William move into Kensington Palace, where he and brother Prince Harry were raised by mother Princess Diana, marking their first official royal home as a married couple. While the move is initially temporary, the following October, they announce they will make the palace their permanent home base in London. In October 2013, the family moves into a 20-room, four-story renovated apartment on the grounds. January 2012—So Hollywood: Kate and William make their first joint appearance at a movie premiere, attending the launch of Steven Spielberg's Warhorse in London. The two meet cast members such as Benedict Cumberbatch and Tom Hiddleston. April 2012—Wax On: New York's Madame Tussauds unveils the waxy likenesses of the royal newlyweds. August 2012—Raise the Torch: Kate and William attend their first Olympics as a royal couple, the 2012 summer games in London. The two are ambassadors to both the 2012 London Olympic Games and the Paralympics. William and Kate Show Royal Baby! July 2013—Welcome, Prince George: Kate gives birth to her and William's first child, the future heir to the British throne, at St. Mary's Hospital in London. A royal aide announces the good news with a proclamation signed by the doctors. 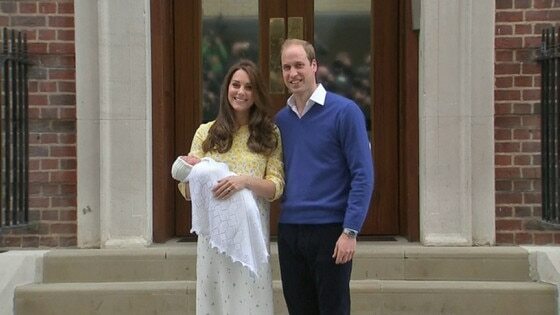 Kensington Palace says that the baby weighed in at 8 lbs 6 oz. and arrived at 4:24 p.m. local time. May 2015—Welcome, Princess Charlotte: Kate gives birth to the couple's second child and first daughter at St. Mary's Hospital in London, the same place where George was born. "The baby weighs 8 lbs., 3 oz. The Duke of Cambridge was present for the birth," Kensington Palace says in a statement, adding, "Her Royal Highness and her child are both doing well." April 2016—Welcome Again, Mr. President: Kate and William meet the Obamas again, this time hosting them at home, at their Kensington Palace apartment. The Obamas meet George, who stays up past his bedtime and steals the show. September 2016—Return to Canada...With the Kids: Kate and William embark on their first official tour with both of their kids, visiting Canada, where they meet Prime Minister Justin Trudeau. They also take the children to a party for the children of Canadian military families. George behaves during part of the trip. March 2017—Bienvenue à Paris: Kate and William visit Paris in what marks their first official visit to the city as a couple and the prince's first official trip there since his mother died there in 1997. The two are guests of the French Foreign and Commonwealth Office and meet with French President Francois Hollande at the Elysee Palace. They later attend a reception to mark the launch of the program Les Voisins ["The Neighbors"], hosted by Britain's ambassador to France, Edward Llewellyn, at the British Embassy. During their trip, Kate and William also visit Musee d'Orsay, where they are photographed looking through its famous giant clock, and are all smiles at the Eiffel Tower, where they met fans and members of a rugby team.